Happy (almost) Thanksgiving! I'm not a huge fan of sending home "work" over long breaks, but I do want kids to read! 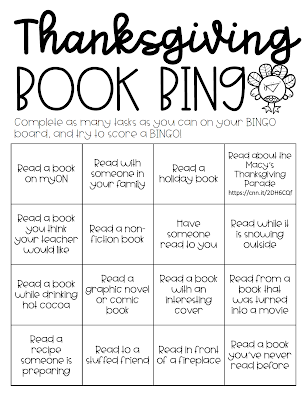 So, I whipped up this Thanksgiving Break Book Bingo for the kids to work on over Thanksgiving Break. 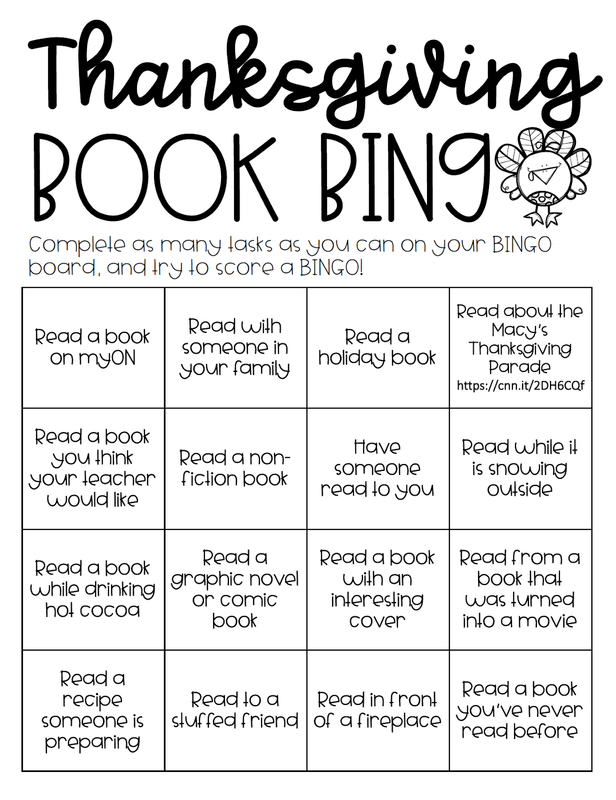 The idea is that they will work to create multiple BINGOs, but I ultimately just want them to have some fun reading over break. If you think your kids would love it, go download a free copy HERE. It's Fall Break time here in Colorado, and these two glorious weeks are something I really look forward to each year. Our school district does start back to school on August 1st, but this two week break, along with a week at Thanksgiving, two more weeks at Christmas, and two additional weeks during Spring Break make the early start worth it! I have realized after almost a decade of teaching that I need a mental break every nine weeks or so in order to really stay at the top of my teaching game. After these two weeks, I come back totally refreshed and ready to teach kids! But...I do miss my students! So, I like to send postcards during our breaks as a little reminder that I'm thinking about them. Here is this year's updated postcard! The thin font is Gangster Napper by Amy Groesbeck, and the thick font is Pumpkin Spice Everything by A Perfect Blend Teaching. The adorable cup is also by A Perfect Blend Teaching and is part of her Doodle Fonts, which I love! I highly recommend purchasing their font bundles...they are totally worth it! You can click HERE to download a free editable set of these postcards to use with your own students. You can add your name and a small message by simply inserting a text box. Make sure when you're trimming them to mail that you maintain a postcard size of 3.5" x 5" to adhere to USPS postcard guidelines. You can download an editable set by clicking HERE. Some of my now 4th graders were my second graders a couple of years ago, so I knew I needed to change it up! More Fun Valentines for Students! Happy Saturday, friends! I am completely procrastinating on some other work I need to finish up, but it seemed like a great time to wrap up Em's valentines for her class. She picked out a box of Descendants valentines, but I always like to make a fun, small valentine for her to give her friends, too. Emoji: This is the valentine I made last year, and Em just loved it! In fact, when she saw me pull it up, she asked for this to be her valentine again. Hey...what can a busy mom say? Of course! We found the glasses at Target in a package of 16 for $3. I wasn't too crazy about the colors of the sunglasses, but Em didn't mind. I attached the sunglasses using a little glue dot in the center. You can download a free copy of the template HERE. Since it's in Powerpoint, you can add a text box to personalize it, too! Heart: This was the version I made 2 years ago, and it's still pretty cute, in my opinion! I printed out a few for Em to give to her neighborhood friends. You can down a free copy of this template HERE. Like the emoji one, you can add a text box in Powerpoint to personalize it. Love it! Pizza: You can check a post back by clicking HERE to see these adorable pizza valentines I will be reusing this year, since I was lucky enough to fund the erasers again this year! Okay, okay...I need to do the REAL work now, so I hope you all have a great weekend! I know, I know...it's still December. But, in my defense, I have to get things done when I get time, and the time is now. I go back to school on January 2nd, and my master's program picks back up on January 4th, so there is no time like now get ahead wherever I can. And that means...on to Valentine's Day! 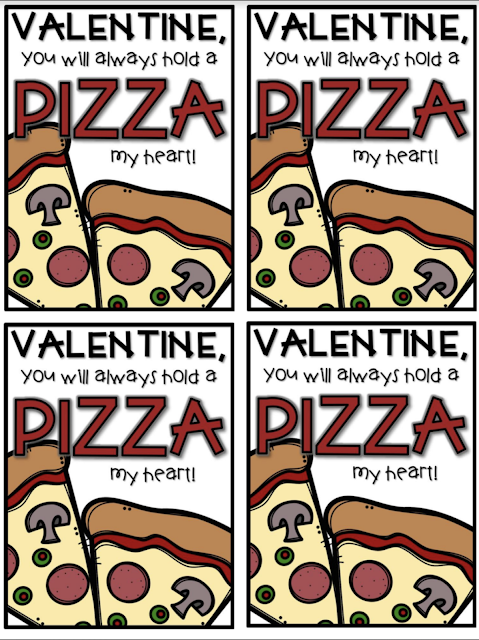 I made these fun valentines for my class year, and I was able to find the exact same pizza slice erasers in the Target Dollar Spot a few weeks ago. So...why redo what was already super cute??? I will probably attach the erasers using glue dots like I did last year. You can grab a copy of the tag HERE. It is an editable Powerpoint, so you can add a text box for your name if you like. Here's to a new year of getting things done and not procrastinating! As I type this, I am curled up on my couch watching a Hallmark Channel Christmas movie called My Christmas Love with my Christmas tree lit up and the fireplace going. Life is good for a teacher on Winter Break! I am also lucky enough to have a break from my graduate classes at the same time, so I finally have a full fledged break for the first time since March. So, I thought I would pop in and share some fun ideas from December. Christmas Measurement Trees: This was a fun idea I modified for the classroom. The kids were each given a 12"x9" sheet of green construction paper. I guided them through most of the activity, showing them how to measure and draw the straight lines. I did a lot of ruler holding because the kids couldn't understand why their rulers kept moving when they were drawing lines! It was kind of funny. Anyways, once they had all their lines traced, they cut them out. I modeled how to fold the ends and glue from the bottom up. All of the kids did fine, and they all had a good time! The concentration on this one's face shows how focused they were on the trees. They were all so proud of their different trees, and I loved how focused they were during the entire activity, especially since it was the hour before their party! Rudolph Ornaments: Every year my class makes these ornaments. They are super easy and have changed slightly from year to year depending on the supplies I find. Usually we use brown glass bulbs, but I forgot that I bought clear plastic bulbs on clearance last year after Christmas. I had self-stick wiggly eyes and pipe cleaners, and I found the stick on gems at the Dollar Tree. I shredded up some brown construction paper, and then kids stuffed it in the ornaments. It was perfect for their little fingers! They wrote their names on the back and were done. Super easy! 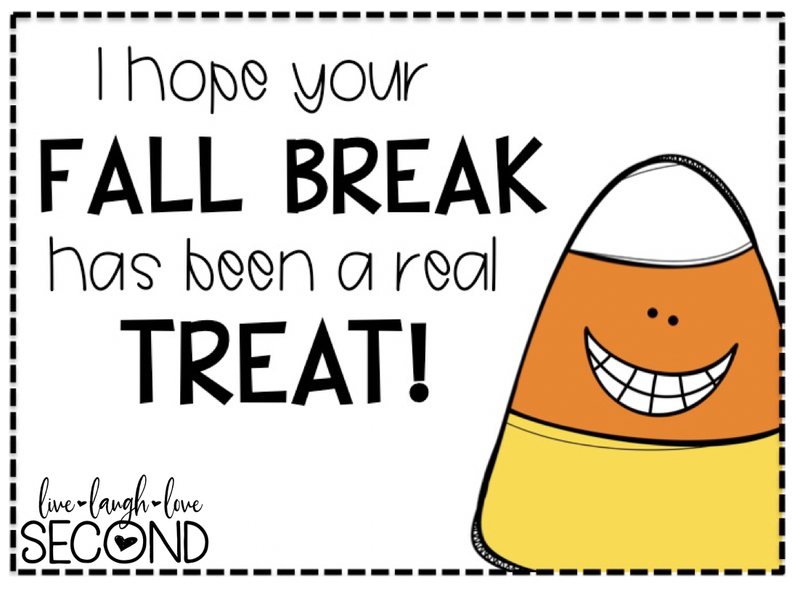 Easy Team Gifts: I wanted to show my appreciation for everyone who has a role in my students' lives at school, but that can add up really fast! So, I bought these hand sanitizers from Bath and Body Works when they were 6 for $5, and made this fun tag to attach them to using Elmer's Glue Dots. Easy, inexpensive, and super cute! And just like that, it's time for another Hallmark movie! I hope you all have a very merry Christmas! Yes. I was one of those people stalking the Dollar Spot in August waiting for the fun Halloween stuff to come out. But...it paid off because I found these fun and cheap sticky skeletons that my students are going to love! I actually found them in the Halloween section just after they started putting stuff out. They were 8 for $1, so 4 packs would cover my class and leave a few extras for my daughter to play with. You cannot beat that! Then, I made this fun tag to go along with the little sticky skeletons. Since the skeletons are sticky, they stuck to the paper with no problem. I did assemble about 4 of them before I decided it would be in my best interest to wait and stick them at school, lest the become a jumbled, sticky mess in my bag. The stick font is FriNally by Amy Groesbeck and the script is Chunky Monkey by A Primary Kind of Life. The bones font is called Cartoon Bones, and I downloaded it from DaFont for free. You can download a freebie copy of this fun gift for your students HERE! Updated on October 28th to include...this fun spider gift! These are adorable spider erasers from Target. The fonts are both by A Perfect Blend Teaching. The thin font is PB Bean There Dunn That, and the webbed font is PB Morning Witch Brew. The erasers were from the Halloween section at Target. They were in a package of 8 for only $1! You can download a free copy of this tag HERE. Happy Monday, friends! The clock is ticking until school starts back up, and for me...it's ticking pretty fast! We officially reported back to school last Thursday, and it has been crazy busy. It might seem like we go back to school early, but we have a great schedule. 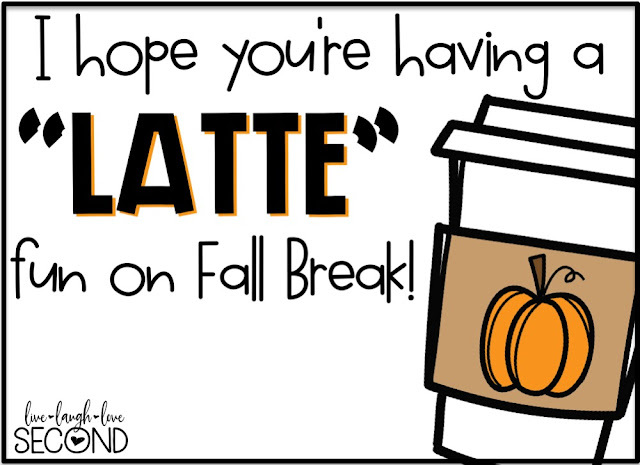 We have a two-week fall break in mid-October, a full week for Thanksgiving, two-plus weeks at Christmas, and a two-week spring break, and not to mention the snow days in between. Plus, we're still out by Memorial Day, so...I won't be complaining any time soon. But...that early start means that there won't be many more Monday Made Its from me, but I managed to squeeze out a few fun things this week, so let's check them out! 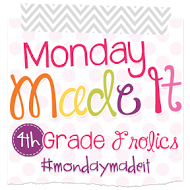 You can join in the link-up by heading over to Fourth Grade Frolics. Coat Hook Labels and Name Tags: Usually I just post the students' names above their coat hook each year. I tried a number system, but then I could never remember which number was who, so I went back to names. Plus I think the kids like seeing their names up there! This year, I decided to be extra crafty and add pictures of each student with their name. It was pretty simple since I could see all the students' pictures in Infinite Campus, our attendance and grading system, and I was able to use these Editable Book Bin Labels by Learning in Wonderland to choose from hundreds of Melonheadz clipart kid images. I was able to find a different image for each kiddo, I added their names, and...voila! Cuteness overload! And...I liked them so much that I decided to make a separate set to wear on the first day of school as a name tag. I just punched holes in the top and looped a pincher clip through for the kids to clip to their shirts. I like the clips, as opposed to lanyards, because they will be easier to see. I also thought they would be great to keep around in the event of a guest teacher or any other special visitors. I came up with this brilliant idea for this upcoming school year. I made the nameplates using an editable template from the Happy Rainbow Collection by School Girl Style and laminated them. However, instead of sticking them on top of the desks, I put them on the front of the desks. Now-this probably won't work for everyone depending on your desk arrangement, but it is better for me because all of my desks actually face me. (If you are familiar with Teach Like a Champion, then this desk setup might ring a bell!) Now I can see everyone's names and they can't mess with them. Win, win! Plus it will be nice for when we have surprise guests, substitute teachers, or new students. Oh! I also attached them with velcro from the Dollar Tree so they can be easily interchanged. I love it! Place Value Practice: shake, write the number, and identify the value of a number in a specific spot. The kids could even turn the boxes to make the greatest number possible. For example, if you look at the yellow box, is 653 greater or would 356 be greater? Addition Practice: This would be a great tool for addition with 3 addends. 6 + 5 + 3 = 14 Or you could combine boxes to make multi-digit addends. So, if I used the boxes below, it could be 653 + 552, or it could be 32 + 55 + 65. I can also envision easy differentiation for these activities, too. Student Workbook Drawer Labels: Even though my students each have a desk, they do not actually use the inside of it. The desks actually lift open, so you can imagine how everything slides right off the desk anytime I ask them to get something out. And it happens every.single.time they open their desks every.single.day. It drove me nuts. You would think they would learn. But...nope. So, enter these Rubbermaid drawers. The kids store all of their necessary materials-workbooks, notebooks, manipulatives-in each drawer. Four students share each set of drawers. Since everything stays in one place, there is none of the "I can't find my..." anymore. So, long story short, I made these fun labels for each drawer using a "Hello My Name Is" free template from I Teach What's Your Superpower?. The kids really didn't have any trouble putting everything where it went, but I like the look of these labels anyways! Well, that's it for this week! But here is a sneak peak at something I've been working on that I just recently finished up and posted on my TpT store. 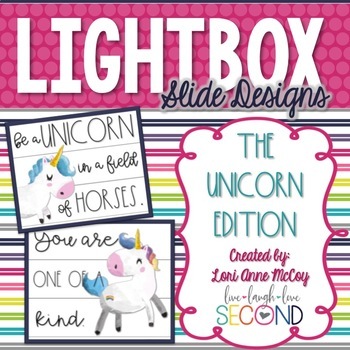 If you own my Light Box Bundle, head over and download the newest update that includes four adorable unicorn slides. You can see them all HERE.